History of Arabic swords. Arabic sword types. Variants include the Saif, Yemeni Jambiya, the Persian Shamshir, the Turkish Kilij, the Moroccan Nimcha and the Afghan Pulwar. 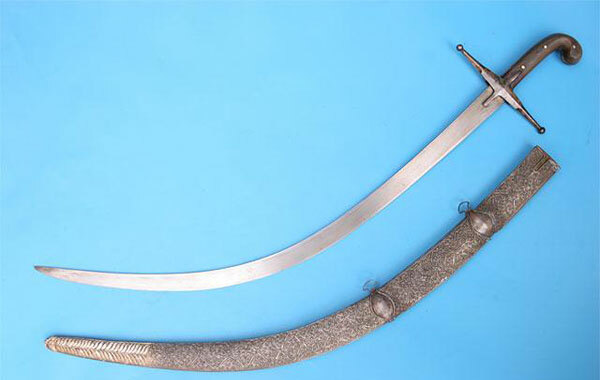 Traditionally, Arabic cultures have favoured a curved, single-edged sword named a saif, of a type known as a scimitar. 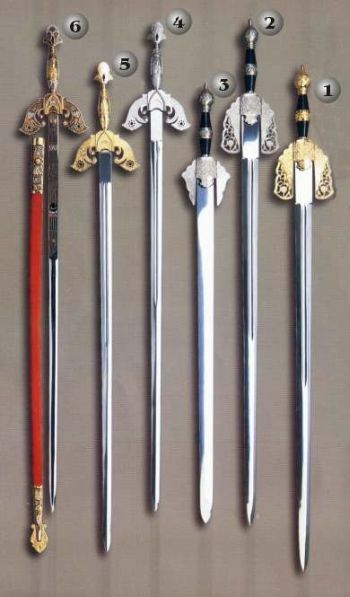 These swords, which vary slightly from one culture to another, all follow a similar design with modifications made to the width, curvature and degree of tapering of the blade. Variants include the Yemeni Jambiya, the Persian Shamshir, the Turkish Kilij, the Moroccan Nimcha and the Afghan Pulwar. The variants are all single-handed swords with blades that curve to a greater or lesser degree and taper across the end third to a sharp, thrusting point. However, swords with a greater degree of curving such as the Persian Shamshir are very difficult to use in such a manner. The guard tends to be a very simple cross shape with langets on the flats of the blade to lock the sword into the scabbard. The hilt tends to be very simple, with no pommel and a large curved protuberance curving opposite to the curvature of the blade. The hilt can be of metal or made from plates of bone, ivory or wood. Scimitars of all varieties were used in mounted warfare against unarmoured infantry. Their light weight and curved design make them ideal slashing weapons for mounted soldiers. Though scimitars are known as backswords, this is not because they were worn in a scabbard behind the wielder’s back. In fact this term refers to the single cutting edge and strong spine to the blade. These weapons were usually worn at the hip. Saif – saif means “sword” in arabic language. Saif is symbol of Jihad (Islamic holy war), Saif is also portrayed on Saudi Arabian flag. This entry was posted in Swords and tagged arabic swords, jambiya, kilij, nimcha, pulwar, shamshir. Bookmark the permalink.